This is the only photo I'm aware of showing the house of ERC&L President, J.G. Bradley. 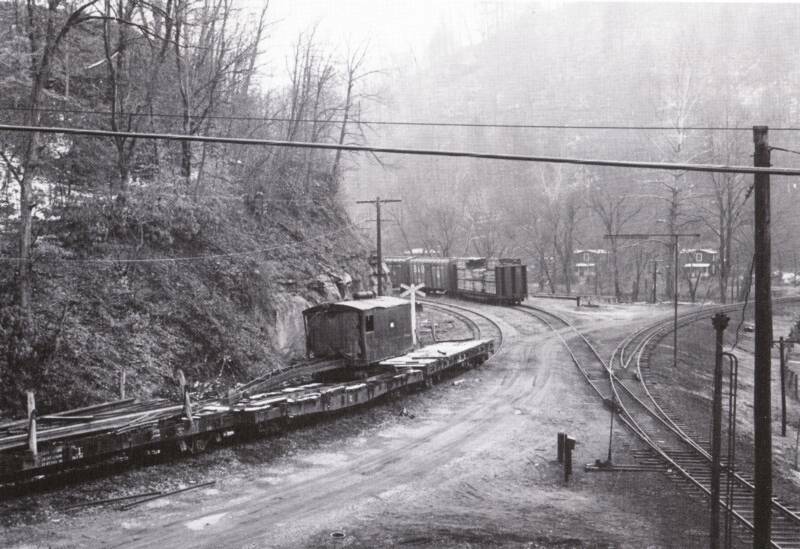 It was taken from page 13 of William Warden's book, "Buffalo Creek & Gauley". While mostly obscured by the pine tree, at least there are no leaves on the other trees. It certainly looks like a home appropriate for the head guy!. It appears that a porch wrapped all the way around the three-story structure. There appears to be a main structure and an extension off to the right. There also appears to be what may have been a garage in the right foreground. It appears that the exterior construction is board and batten. 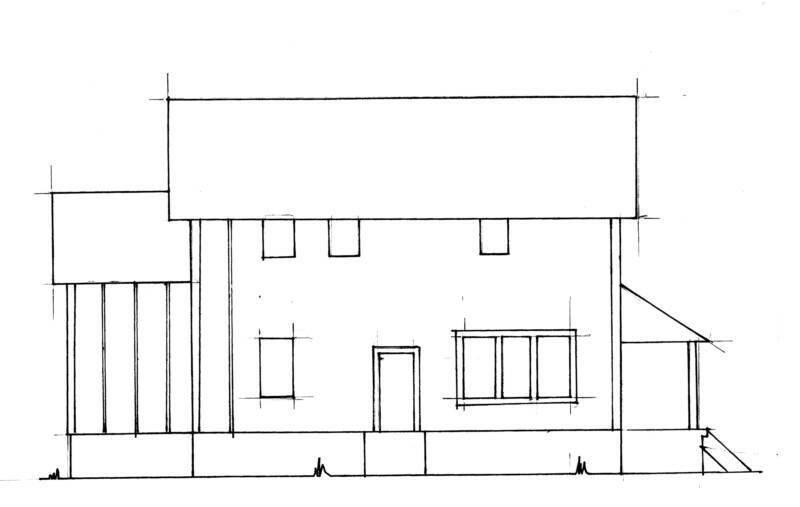 I would say this is an unusual configuration for a building this large, especially a residence. Notice the neat lattice below the porch. Based on this lone photo, I would guess the structure was red with with trim. During a 2007 conversation, Roger Nutter, BC&G Co-Op President, indicated that the house was destroyed by fire set by vandals. According to a 1977 issue of GOLDENSEAL the house was still standing in that year. This photo might have been taken from the road . The line of large poplar trees is still in place although nothing remains of the house. During the June 2007 trip in Nutter's Fairmont speeder, Roger pointed out this stone footing (photo, right) along the track near the site of Bradley's house. He said it was the foundation for the BC&G passenger platform. 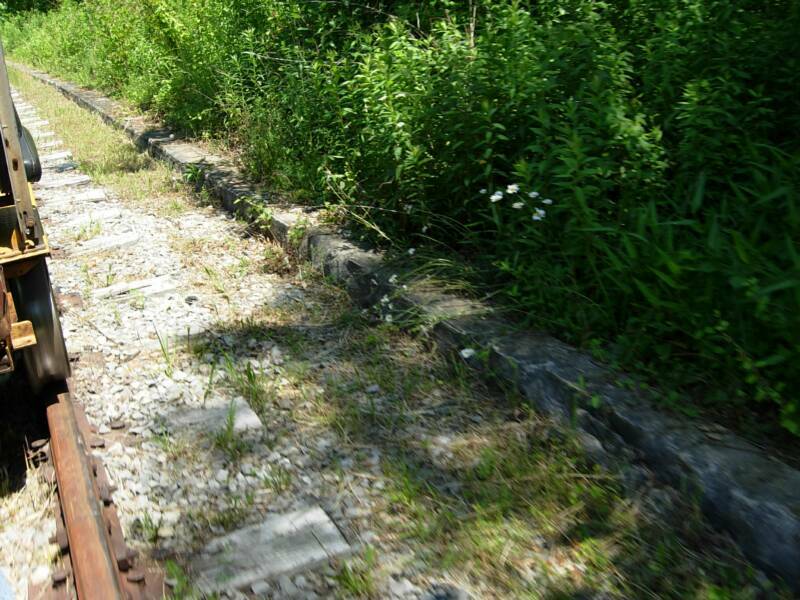 It can be scaled from the rails in the corner of the picture, but looks to be 50 feet long or more. It seems far bigger than the BC&G would have needed for passenger loading. Patsy Baughman, who grew up in Dundon and walked in the area of Mr. Bradley's house many times in the 40's and 50's is certain there was no station platform in this area during those years. Patsy Baughman had a unique opportunity during her childhood to visit Bradley's house. She and her mother were friends with "Nellie" Balwin, Bradley's housekeeper and Patsy's memories of her visits paint a wonderful picture of what the house, and Mr. Bradley, were like, both inside and out. Below is Patsy's unique account, no doubt the best description of the house ever reduced to writing! Thanks, Patsy! "I would not desribe J. G. Bradley's house as elegant. It was in a beautiful setting a short distance from the Dundon office. The office and Bradley's house had an adjoining lawn with huge trees surrounding both buildings. The house was quite close to the railroad with the office being more in front and closer to the car road that went around the office and in back of Bradley's house. "The wrap around porch went across the front of the house and one side toward and past the kitchen. 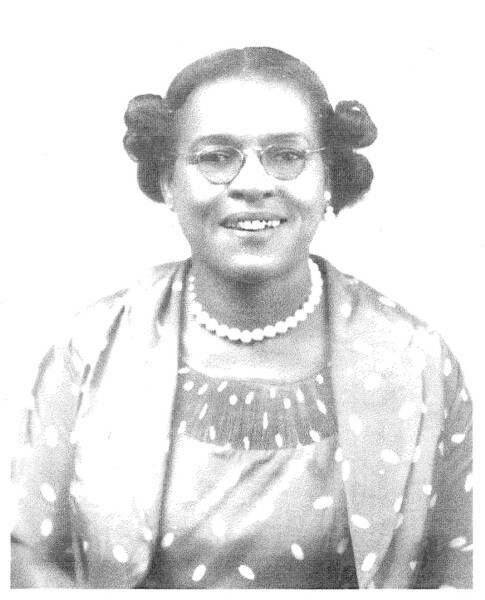 When visiting "Nellie" Baldwin, Bradley's African-American housekeeper (see photo at end of this article), we always went up a path along the railroad tracks, through a back gate which led to the porch and back door entering the large kitchen. This kitchen had a large coal-burning cook stove as we all had at that time. To the right of the kitchen was a small formal dining room with a round table, probably cherry, with a lazy susan attached. Nellie would entertain us there and not in the other areas. I fondly remember our first visit as she served me my first grape Kool-Aide and I thought it was wonderful. "A narrow hallway led into a large library-type room with a stone fireplace. Also a narrow hallway led from the kitchen into another library-type room. From this room an open stariway led to the living quarters upstairs to a second and third floor. This stairway was dark, perhaps oak, going up several steps to a landing and then the stairs reversed more steps onto the second floor which was the family's bedrooms and bath. The single flight of steps went on to the third floor to Nellie's bedroom and bath. I remember very spacious but ordinary bathrooms. However, I did not observe the bedrooms. "The downstairs' so called 'libraries' had adjoining doors close to the kitchen and close to the front porch making them each accessible to the other. Both of these rooms had floor to ceiling shelves of books and they were beautifully bound books of all kinds. Also, there were several desks with typewriter and desk lamps. This almost gave you the impression of a stenographer's pool, but it wasn't. These rooms were dark and drab, and the walls were dark and varnished horizontal boards probably about three inches wide - just like we had in our houses - no paneling. However, there were several windows which did permit some light, but with the trees and mountains it somewhat dark. "There was a garage where a car was kept for Bradley's use. A male chauffer was always available to drive him whenever he was in residence which to my opinion was not often. Also, of course, his Motor "A" was in a garage across the tracks. (see Railbus Sheds). 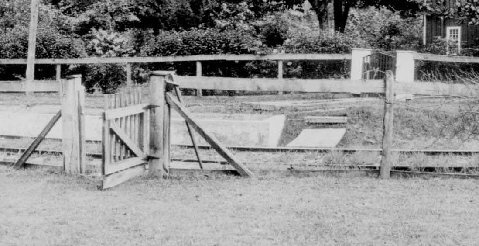 "Another separate building along the tracks was an ice house providing blocks of ice for use before refrigeration was available. Other buildings along the tracks were maintenance and equipment sheds. Also, almost forgotten is the bridge across Buffalo Creek in this area. It was not for vehicles but it was a wide pedestrian bridge. (The one at Swandale was narrow and probably just wide enough for two people walking side-by-side.) It was quite nice and I always thought quite picturesque. The bridge led to three houses which included the boarding house and two finer houses occupied by management. These two wereprobably considered the "finer homes in Dundon". "I think I was quite priviledged to have visited Bradley's house and to know Nellie. She was a good friend to my mother and I. She wold only be in residence when Bradley was going to be in town. 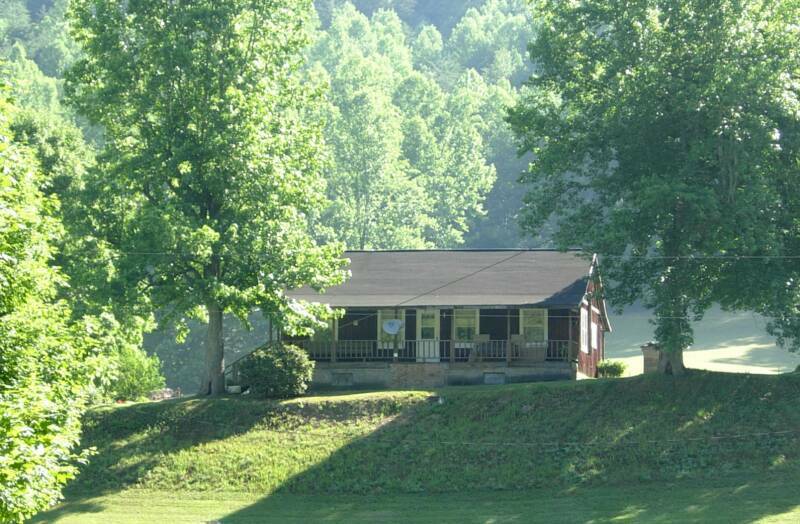 Her home was in Greenbrier County, WV and she also worked for an attorney in Charleston. Bradley's secretary could always locate her and have her there whenever she was needed. "I saw Mr. Bradley up close one time and it was a frightening experience. My mother sent me to the residence with a basket of tomatoes, etc., from her garden. Nellie always told my mother that Mr. Bradley loved sliced tomatoes for breakfast - with sugar on them. I made a mistake by going to the front library door rather than the back kitchen door. Mr. Bradley answered and he was very well dressed and seemed to have a reddish-purple fac. He, of course, was very appreciative and nice, but I surely wished Nellie had answered the door. "My mother and I were friends to Nellie. She was alone in the house so much of the time and she would visit us as well. Nellie could not read or write and my mother encouraged her to get her social security card and helped her as much as she could. And she was the only African-American in Dundon or Clay. I was probably the age of thirteen when I met her and I must say it was a privilege to have that friendship. She probably "bent the rules" a bit as she would let me borrow books from that extensive library of Mr. Bradley. I could take them one at a time and when I returned them I could take another. That was my introduction to some classics such as Wuthering Heights, Jane Eyre, The Scarlet Letter, etc. Sometimes I would take one home that would be entirely over my head or just plain not interesting. I do wonder what happened to that extensive library. Someone surely did benefit from his collection. "I can still picture those rooms today so vividly - the books, desks, Underwood typewriters, etc. And I must say I was privileged to have grown up in Dundon." This page contains information about the company houses at Dundon. The material is grouped in two broad categories...J.G. 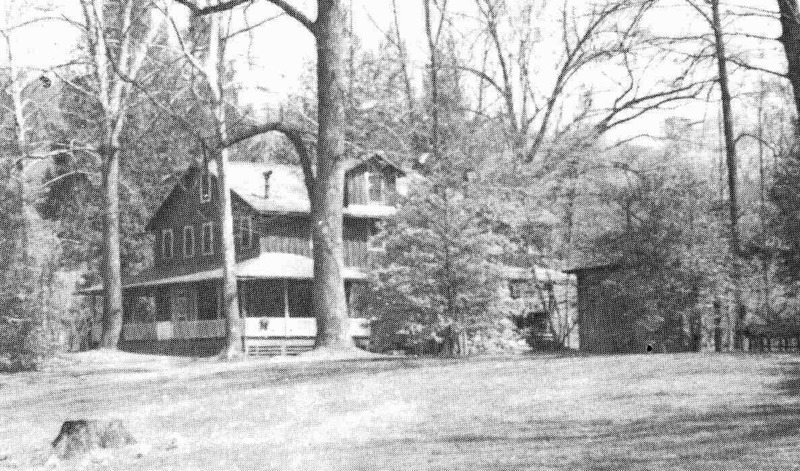 Bradley's House and the so-called "Red Row" company houses that were located across Buffalo Creek from the Dundon Shops and finally John Lanham's singe-story house. 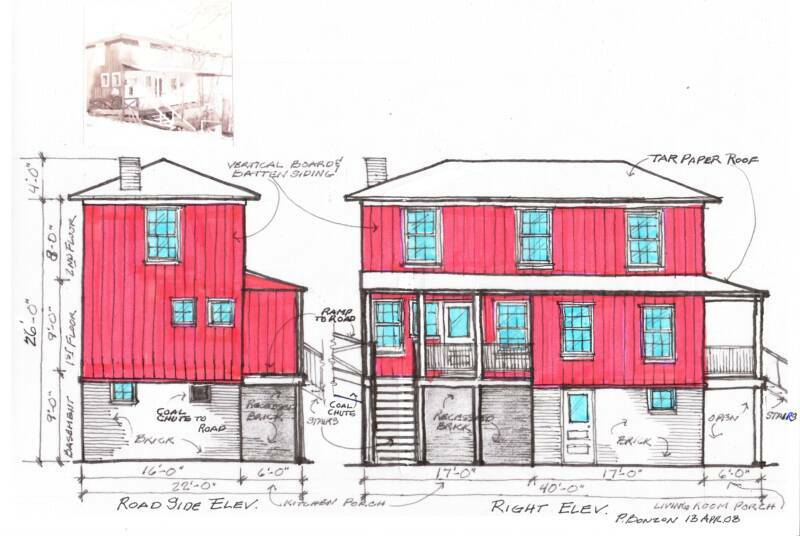 Thanks to Patsy and Herald Baughman and Ron Bonzon for working out the details of how the 'Red Row' houses looked. 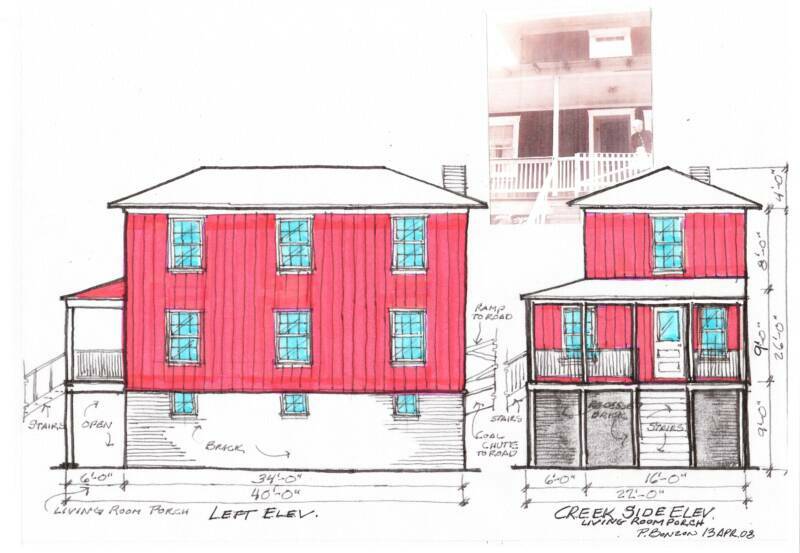 Ten two-story company houses were located between the road and the Buffalo Creek across the creek from the BC&G shops. 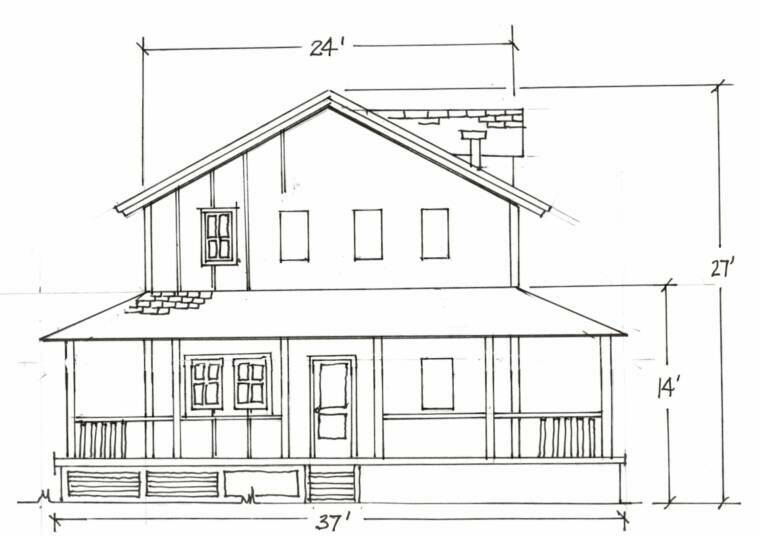 Based on photos and verbal descriptions provided by Patsy and Herald Baughman, Phil Bonzon created these excellent drawings of the houses as they appeared in the 1950s. For photos of Phil's finished models go to OTHER LAYOUTS / PHIL BONZON. Some of the "Red Row" houses are just visible through the trees (yellow arrows) in this photo by Jeff Madden. You can enlarge Phil's drawings and this photo by clicking on them. This part of town was also known as Lower Dundon. This one-story company house sits across the B&O tracks (foreground) from the site of the company store and opposite where the B&O station stood. The house is occupied today. It was typical of the one-story houses in Dundon, Cressmont, Swandale and Widen. According to Patsy Baughman, it was at one time occupied by Loring Wilson who was the foreman of the carpenter crew that would paint, repair and take car of necessary plumbing or electrical needs of company houses. When John Lanham moved from Swandale to Dundon, he moved into this house. John was responsible for maintaining the telephone lines along the BC&G right-of-way. The house has likely been expanded from it's original size but is otherwise an "orginal" company house. Patsy believes it would have had a dormer when originally built. Compare it to the similar house still in use in Cressmont (below). 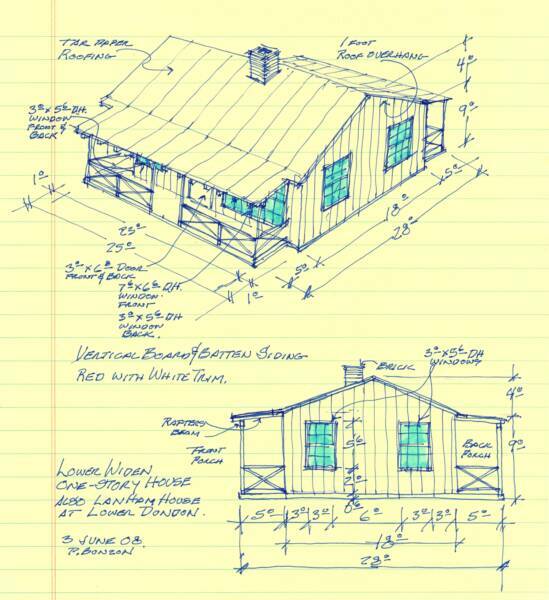 See below right for Phil Bonzon's sketch of this type of house and Phil's Dundon page for his model of it..
Phil Bonzon's sketches of a typical ERC&L one-story company house. 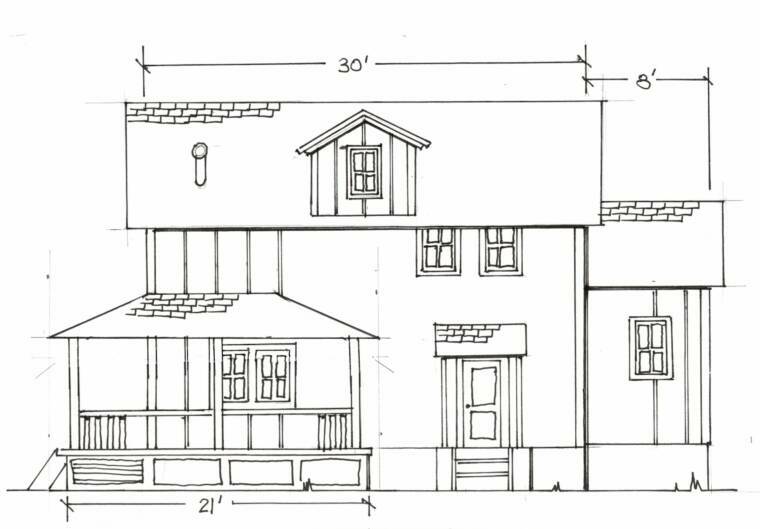 These were constructed in Dundon, Cressmont, Swandale and Widen although the houses in Dundon and Swandale had front dormers. Patsy Baughman has provided many, many wonderful details about the structures of the ERC&L. One that she pointed out about the company houses is that the configuration of the railings on the porches of the houses was different, depending on where the house was. 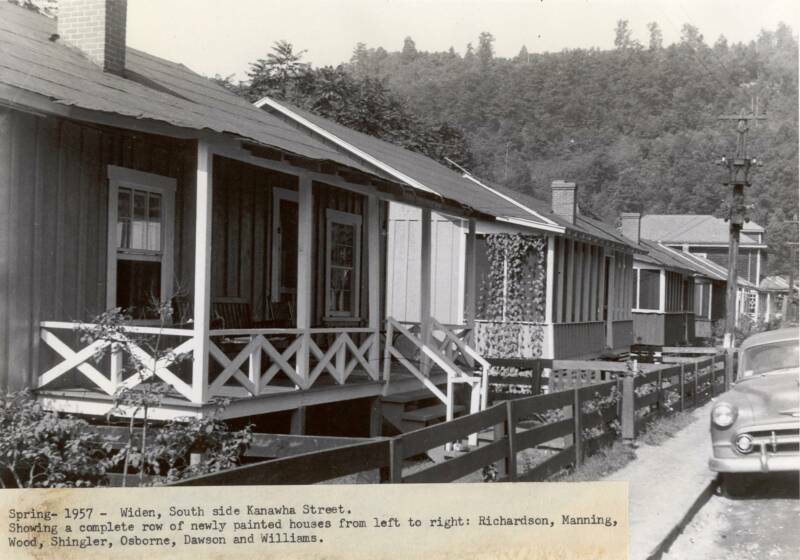 Houses in Dundon and Swandale had vertical elements in their railings, but houses in Widen had a "criss-cross" pattern, as seen in the 1957 photo above. There was an exception,however. The raised walkways into the houses on Red Row in Dundon had the cross-type only on the walkway itself, with the vertical elements on porch. 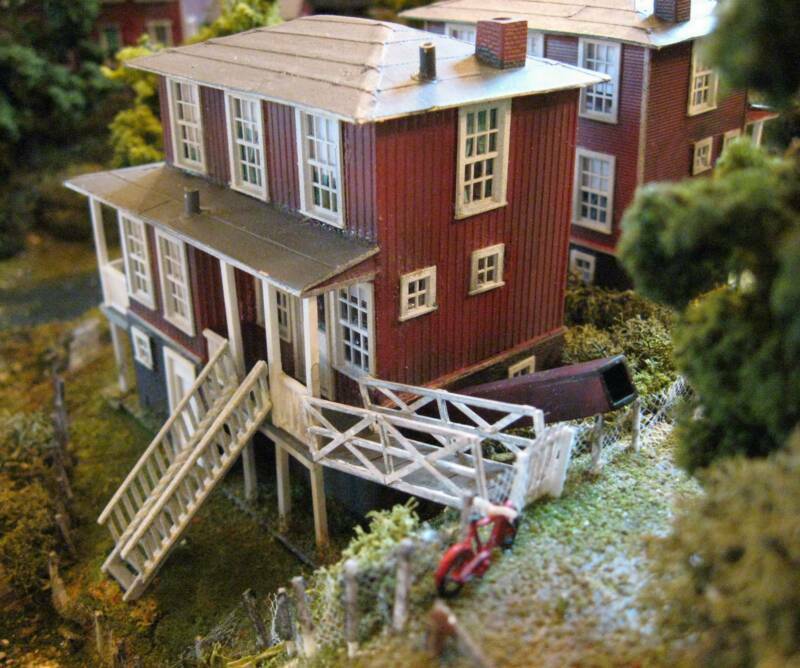 Phil Bonzon has correctly reproduced the walkway railings on his models of the Red Row houses (right). This wonderful photograph shows the Lanham house as it appeared in the 50s (over the hood of the car). 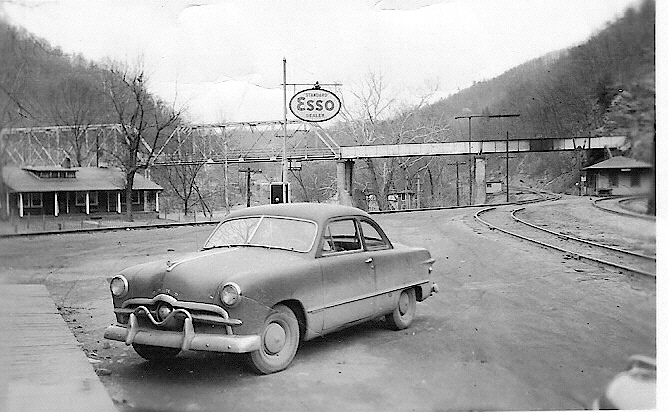 According to Patsy and Herald Baughman, the Ford belonged to Charlie Stidom who was a delivery boy for the Dundon Store. The car is parked in front of the store. The Baughmans point out that just visible down the embankment by the river is a pumphouse (yellow arrow) for drinking water for Dundon residents. Phil Bonzon extracted this close-up from a panoramic photo of the area near Bradley's house (visible in the background). It appears that a concrete structure (arrow) is visible in the same place as the stone foundation in the 2007 photo above. 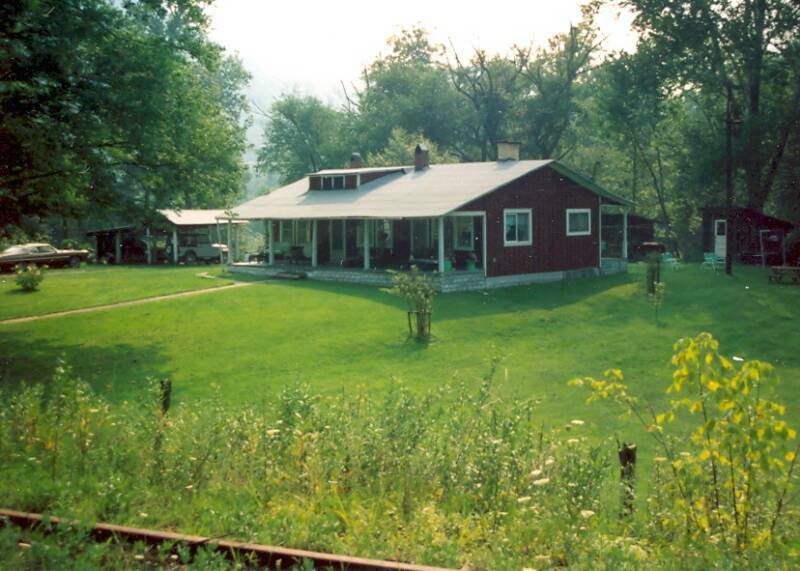 The Elk River Coal & Lumber Company constructed a "Community Building" in Dundon, similar in nature to the ones built in Swandale and Widen. 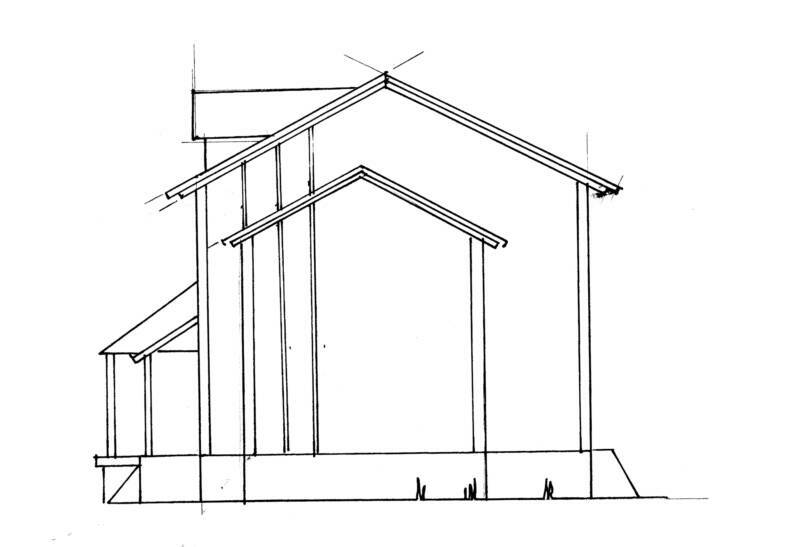 Below are the only two images available to date that show the structure. It's location can be seen on Phil Bonzon's excellent map of Dundon. The large wooden structure was situated about half way between the Dundon Shops and the Dundon Company Store and was nestled between a road and the railroad tracks on one side and the Bufflalo Creek on the other. Connie Acree provided the photo on the left and Patsy Baughman sent the photo on the right. Together these two women provided the following information about the structure, its arrangement and its uses. The building contained a gymnasium that included a raised stage with curtains. Besides basketball games, sock hops, pie socials, and halloween parties were held here. Sometimes on weekend nights boxing matches were held. A big boxing ring was set up on the gym floor and during the day school kids would play in the ring. At one time while an addition was being made to the school, 5th through 8th grade classes were held in the Community Building. The basement of the building housed the workshop and tools for the town's carpenters, Rance James and Roy Nichols. They did all the repair work on the houses and wooden bridges in the Dundon area. This view from the Connie Acree collection shows the send of the building that faced "down stream" toward the B&O interchange. The road was to the left and the Buffalo Creek on the right. The doors under the larger entranceway roof led directly into the gym while the smaller doorway went to the bleacher section. See Dundon map for the location of this structure. 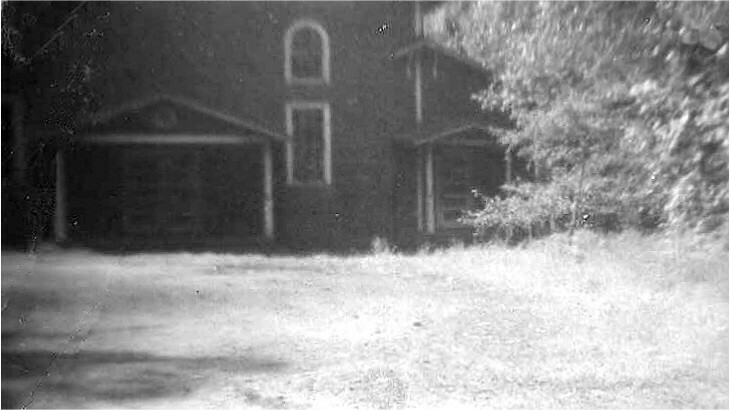 This photo was taken by Patsy Baughman around 1949. That's Herald Baughman and Roscoe Friend in Roscoe's dad's car. In the distance the roof and chimney of the Community Building is just visible. The creek is on the left and the road and railroad is on the right. 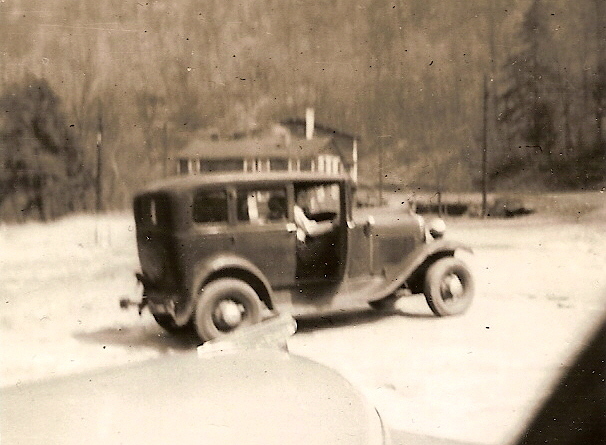 The house visible above the car is that of Roy Drake who was a supervisor of rail maintenance in the Dundon area. 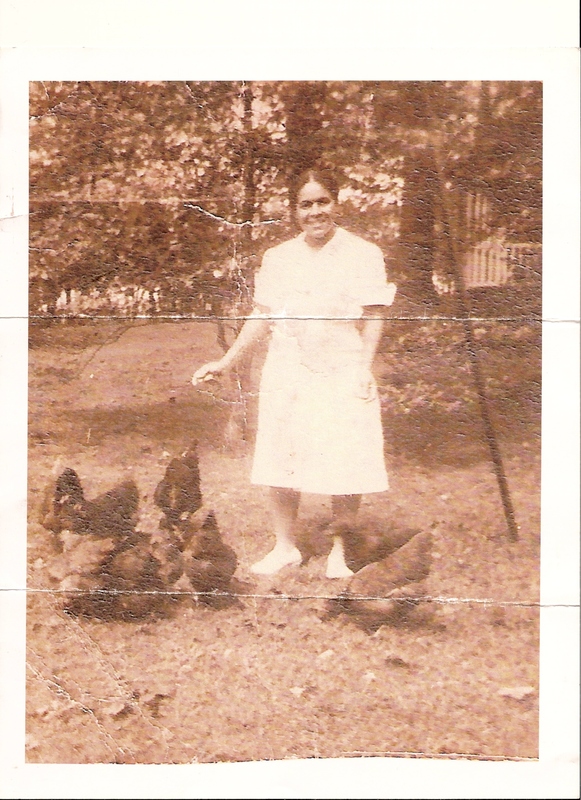 Nellie Baldwin feeding her chickens.